Warning: major spoilers ahead for Episode 16 of Season 4 of Arrow. Arrow has had a lot going on in Season 4, and the last handful of episodes were mostly consumed by League of Assassins shenanigans and Oliver’s secret kid from Central City. Now, the show is back on the air after a brief hiatus with Episode 16 – entitled “Broken Hearts” – and it's back on track to deliver on a tease that's been hanging over Season 4 from the very beginning. As Felicity helpfully reminded us in “Broken Hearts,” five months have passed since the premiere, which means that the big reveal of the person in the grave will be coming in the very near future. And considering the events of the episode, there’s one character whose journey on Arrow is likely end in the very near future: Laurel Lance. Back when the flash-forward first revealed a wrecked Oliver standing over a grave, Laurel seemed like an unlikely candidate. The Black Canary is such a major DC Comics character that killing her off seemed almost too bold a move for Arrow, and surely Laurel wouldn’t have gotten her mask in Season 3 only to be killed in Season 4. Given the target she painted on her back in “Broken Hearts,” however, it’s looking more and more like the only Canary who will be left to cry in the Flarrow-verse will be Sara. 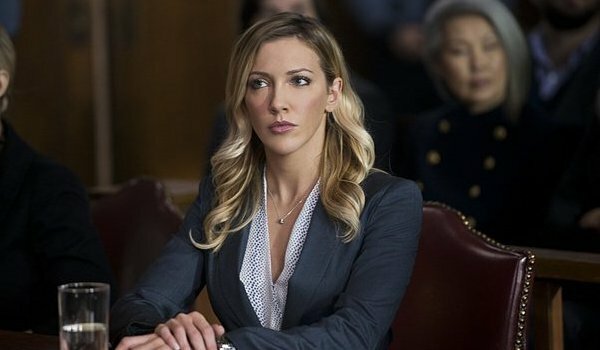 The Black Canary actually had the week off so that Laurel Lance, Esq. could take the stage and prosecute the recently de-powered Damien Darhk. Although it was only a preliminary hearing to decide on whether or not he would be granted bail, tensions ran high as Laurel had to find a way to fight Darhk from within the justice system rather than from behind a mask. She pulled out all the stops in trying to find witnesses to testify against Darhk, even issuing subpoenas en masse. Unfortunately for her, those witnesses were too afraid to testify, and Laurel has painted a bullseye on her back. Darhk never once looked frightened of Laurel’s legal handiwork, and his demonic grin at the end of the episode is proof enough that he hasn’t lost his vengeful edge along with his magic. Laurel’s fate looks even grimmer when taking into account her father’s actions in “Broken Hearts.” Quentin announced to the courtroom and reminded the audience that Damien Darhk had promised to kill Laurel if Quentin did not cooperate. Quentin’s testimony is the one factor that motivated the judge to imprison Darhk without bail; assuming that Darhk escapes to bring a reckoning on those who betrayed him, Quentin may soon find that Damien Darhk is not a supervillain who bluffs. Of course, Arrow has been known to pull some pretty epic switcheroos in the past, and it may turn out that Laurel isn't the Lance to bite the dust in Season 4. Quentin was always one of the most likely candidates for the death. He’s not a full-fledged member of Team Arrow, he's not irreplaceable, and he lifts out of the narrative relatively easy. Perhaps testifying against Damien Darhk was enough of a transgression that Darhk will bypass killing Laurel just for the satisfaction of killing Quentin. Alternately, Darhk could kill Quentin in retaliation against Laurel. There are still a couple of episodes before we’ll find out who is definitely in the grave, and anything can change between now and the big death. Assuming that nothing changes Damien Darhk's big new motive for revenge, however, “Broken Hearts” may have just kicked off the swan song for Laurel or Quentin. If the Lances are your favorites, the time is now to cross your fingers and make a wish that “Broken Hearts” was bluffing. Arrow airs on Wednesdays at 8 p.m. ET on The CW.